On Monday evening I had the rare pleasure of joining a dozen members of my Walla Walla tasting group for a romp through a half century of vintage Ports from W&J Graham’s. The company dates back to the year 1820, when it was founded by brothers William and John Graham. Seventy years later the company began investing in vineyards up the Douro, rather than simply purchasing wines and blending them, as was the standard practice. 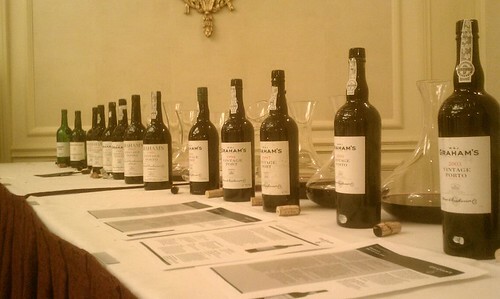 During the first half of the 20th century, Graham’s vintage Ports attained worldwide acclaim thanks to such landmark bottles as the 1908, 1912, 1924, 1927, 1945, 1948 and 1955. Our tasting this week covered the second half of the 20th century and the beginning of the 21st – 14 declared vintages dating from 1963. The wines came from a single source and had been purchased upon release by the original owner. They looked to be in fine condition (thanks to Brian Rudin for the photo above). One was slightly corked, and one had a very odd aroma that no one could identify. Here are my notes on the first half of the flight. 2007 – Big, fruity, forward, loaded with luscious berry flavors. Full, ripe, round and already thoroughly delicious. Will it age as well as some of the older vintages? 2003 – This was the corked bottle. Not so bad that all fruit was gone, but certainly diminished. Thankfully, one of the least interesting vintages. 2000 – A classic, and one of my three favorites of the night. Smooth, fruity, and complex, with a generous mix of fruit flavors, baking spices, and a dusting of powdered sugar. 1997 – A very hot year, yielding a pruney, dark, concentrated, syrupy wine. Molasses, coffee, and a sugary finish. 1994 – Still youthful, raisiny, loaded with plums, figs, espresso and dark chocolate flavors. 1991 – Weird aromas of plastic and chemical. Not corked, but not right. Salty and savory flavors, without much fruit. Bottle appeared to have been recorked at one time. 1985 – Smooth and fruity, loaded with chocolate, cherry and tobacco, a high note of candied orange peel. In fine shape, drinking nicely, but plenty of life ahead. I will post up the notes on the older wines tomorrow!